Simple is better right? Sometimes, sometimes not so much, it depends on how well the product works in the end that determines that. This particular product review is unique, in that it is obviously made at home by what I’ll call a backyard engineer. What gave away that? The Velcro and the wood. But don’t be so quick to judge. One thing is for certain, is that I love the ingenuity of this product and am glad there is this product like this to review. What blows my mind as a reviewer of back shavers, is that out of all these other back shaver review websites not one of them has reviewed the Silky Back. Huh? Well, at least I never found one. 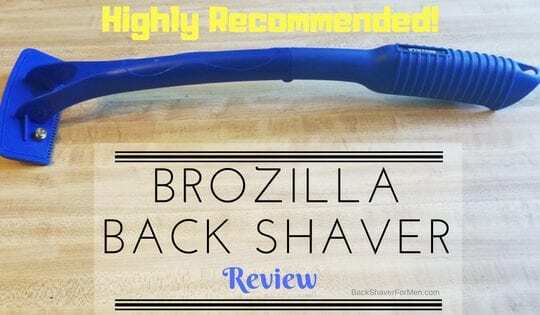 In this review of the Silky Back Shaver and Razor Extender review, I will help you determine if this shaver can deliver a good back shave. As this shaver is very uniquely made from trees. From what I can tell this is built using just 6 materials: wood, glue, varnish, two screws and seven nails and a piece of rope. Simple, this is kind of refreshing after reviewing high-end products made out of plastics and moving parts. Easily handles and secures the biggest razor I own. Environmentally friendly. I just love the fact this product won’t be taking up landfill space if it breaks, unlike anything made of plastic. I love wood and believe we as people should be getting away from using plastic as much as possible and whenever we can and going back to more wood and glass products. So who is this backyard engineer anyway? The builder and owner is Pim Epler of Silky Back. You can visit his website here, www.silkyback.com. I’ll post it below also. Any questions about ordering or information about the product, he gets back to you quickly. 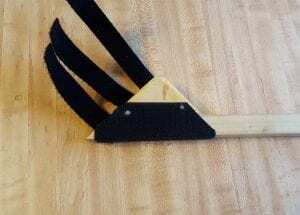 1 – 22 inches solid wood (pine) long handle. 3/4 inch X 3/4 inch width and height of the handle. 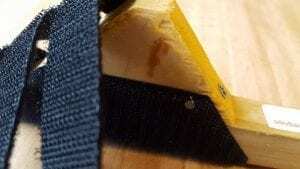 The locking mechanism for holding down the razor is three Velcro strips that wrap around the top of the razor then attach to velcro on the other side of the Silky Back. How Does The Silky Back Shaver Perform? Don’t be fooled by appearance, when it comes to this shaver. 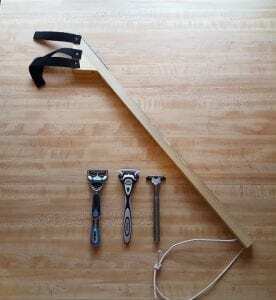 As this performs better than some manufactured back shavers of similar concept and design. How’s that for backyard engineering? Nailed it, literally. One, for the small guy. The locking method of securing the razor to the Silky Back Shaver is again simple. Well, you heard of Velcro right? The three Velcro straps do a good job of securing just about any size razor to the handle. I tried the five different razors I own and they all fit securely. There is literally no movement up or down but there is a slight movement horizontally. The good news is this doesn’t really affect the shaving at all. 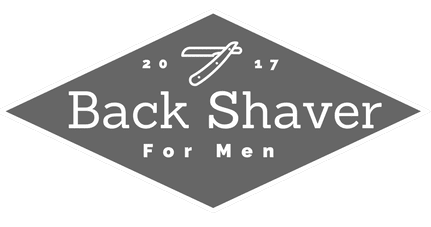 I experience zero problems with movement using the Silky Back, unlike the Razorba products that tend to allow the razor to turn occasionally when shaving. You can read more about the Razorba products here, Razorba Silencer Review & Razorba Back Shaver Review. I loved the length of the long handle and was able to reach the hard to reach areas of my back. Maybe a curved handle would work a little better in certain positions. A surprising feature of this handle is that it fits very comfortably in your hand. I thought I might not like it, as the sharp corners caught my eye right away, but it fits in my hand great. You are able to also choke up anywhere on the handle and still have the same good comfortable grip. Kudos. Just like the Egyptians, Silky Back gets the angle right. The angle of the razors placement on the Silky back shaver, as this could be a hit or miss thing, and is paramount to working efficiently and correctly. I found I didn’t have to adjust my arm, wrist or elbow to get correct contact with my back. It shaves intuitively and naturally, as you are not constantly fighting for the correct angle. It simply works. What Is Included When Purchased? 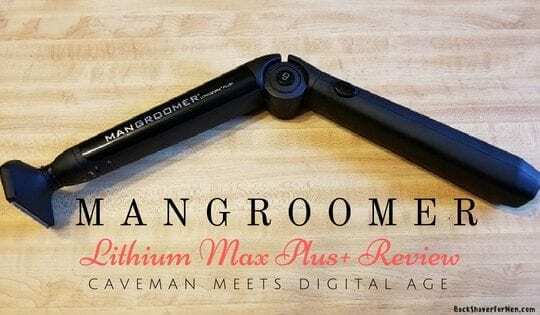 Longest back shaver currently on the market and that I have reviewed. This comes in at an unloaded 22 inches and when loaded with a razor comes in at 23 inches. Not only is it the longest back shaver but it is also the cheapest back shaver out there. It cost at the time of this review $11.99 and $2.95 for shipping, for a grand total of $14.94. 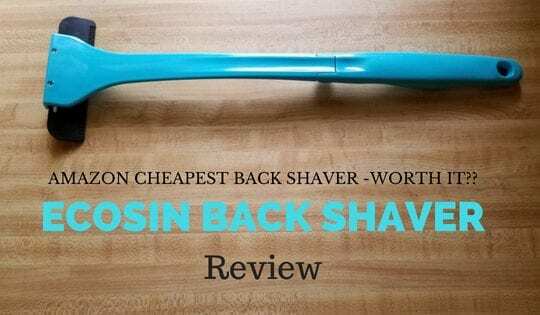 It’s simple design and materials make it the most environmentally responsible back shaver I have reviewed. If this thing should ever break on you, I do not see that happening, it is made of mostly out of wood and would decompose naturally if left naturally in the environment. Unlike most shavers that are made out of plastic, they will never decompose and are landfill material. You could probably just burn this in your fireplace or firepit and no physical footprint left. The handle at first impression would look uncomfortable because all of the sharp right angles, but it fits great in my hand and is very comfortable. Will not rotate in your hands at all. Once you have all three strips of velcro in place, there is little up and down movement of the razor. Makes a hell of a back scratcher, as the velcro gives a pleasurable scratch. As I review products laying around my desk a need to scratch my back often arrives, so I grab what is closest. A lanyard is attached to this shaver for a better grip of simply hanging it for storage. This can be used on other parts of the body as well, especially the legs. Great for people with lack of mobility that need to shave their legs as well. I have five different razors and they all were able to be secured on the Silky Back Shaver. The biggest was the Gillette ProGlide Power and it fit just as well as the skinnier razors. I even tried my wife’s leg shaver and it fit also. The ability to choke up on the razor and to have the same grip wherever you place your hand is nice. You are able to place your hand anywhere on the handle for almost the complete length of this shaver. Very versatile. For being so simple, this shaver shaves very intuitively, as I don’t have to adjust the angle of my wrist at all. The Silky Back gets the angle right for razor placement. Helpful owner answered questions right away and responded to emails quickly. Simple, solid construction should last a lifetime. When you have the razor firmly in place on the Silky back, there is no movement up or down, but there is a little side to side movement but…it doesn’t really change the angle of the razor, which is a good thing. It just not completely locked into place. Unrefined on some of the pieces of wood. As some of the wood, although not actually ever should be in contact with the skin is left unsanded. The back side of the triangular pieces is really rough. This is purely cosmetic, but I would prefer to see nice rounded edges, sanded corners, not rough cuts. There is a slight possibility of getting a sliver from the back side of this. I have held a job working with wood and this should be sanded to a smooth finish before the customer gets it. Not a huge deal but worth noting. Shave time is a factor, as most people who purchase this will be using their beard or leg razors in conjunction with Silky Back. As the razor width is usually only at a maximum of 2 inches, unless you shave with the Razorba G.O.A.T razor which is 4 1/2 inches wide, it takes awhile to shave such a large area of a back. You can read my G.O.A.T review here, Razorba GOAT Wide Disposable Double Razor Review. Example of rough cut finish. Depending on the type of razor you are using with Silky Back determines what is the best shaving method. I shaved my back being freshly showered but a completely dry back. I find short deliberate strokes work best for my shaving experience. Also cleaning the razor as often as needed. Both tapping the wood on the sink as well as rinsing it with water. Depending on the shaver you are going to use, optimally you want your razor to extend about an inch from the wood handle. Some razor might require more or less depending on how it is built. 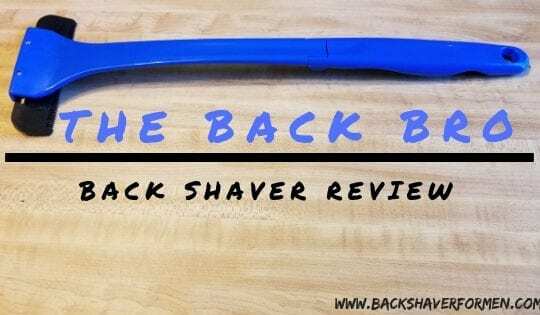 As I begin to wrap up this review, I am left pleasantly surprised at how I feel about the Silky Back Shaver and Razor Extender. I feel it performed well for what it is designed to do. It outperformed, in my opinion, other manufactured similar designed back shavers. Cough! (Razorba) It’s the cheapest shaver I reviewed and you sure get your money’s worth with this shaver. 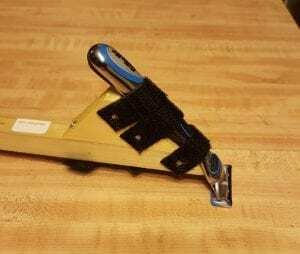 I originally thought less of it because of the homemade-ness of its design and build, but it won me over as a decent back shaver and razor extender. It definitely fills a niche within a niche. 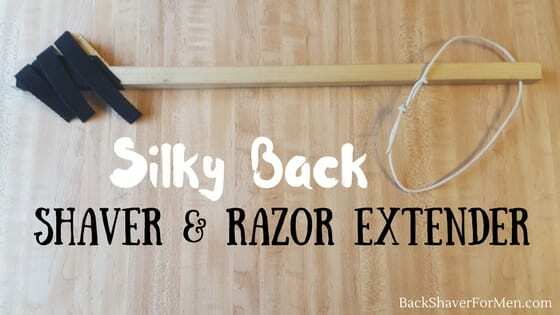 For a cheap back shaver to a razor extender for a person lacking mobility. With a proper razor, this will leave you with a silky back. It’s wood and Velcro but it works! Couldn’t test performance as no razor is shipped with it. Very intuitive when shaving, you always get the right angle. Some refinement can be made for improvement. If you have any question feel free to drop them below.